Our man Bubba was wandering the streets of Montreal, probably asking various bartenders how to say “Irish Car Bomb” in French. But he was thinking clearly enough to recognize where the locals’ priorities lie. 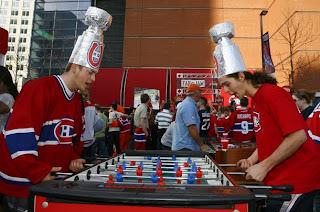 The Montreal Canadiens have a rich history with 24 Stanley Cups, though none since 1993. They are the #8 seed in the NHL’s Eastern Conference. The GM (Bob Gainey) recently fired the head coach (Guy Carbonneau) and installed himself, and both are franchise legends. They lost their last 4 regular season games. It’s a soap opera, but the fans are as hooked as ever. It has been almost 23 years since I last visited "The great white north" aka Montreal, Canada. I am currently on assignment in Montreal for UFC 97. I totally forgot the frenzy this place gets into this time of year. It was an amazing scene last night on St. Catherine's street as I walked down the sidewalk looking for a place to eat. I saw 30 people (men & women) standing in front of a TV store watching the Montreal vs Boston Stanley Cup Playoff game through the glass. It must have been 30 degrees but it didn't bother anyone as they just carved out spots like they were watching at a party. It reminded me of the old black and white footage I saw growing up of people in America watching the first Space launch. We were about to enter a restaurant and I heard a thunderous roar echo down the Street... The Canadiens had just scored. It was amazing. Even more amazing is how young some of these fans are. If they could walk or talk they were fans. Not sports fans, hockey fans! 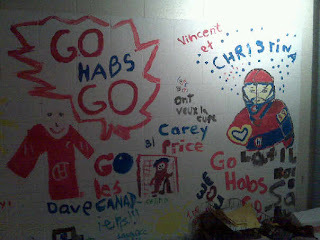 Little kids must have it in their DNA since they already knew all the names of their beloved Habs (Les Habitants). If you look at the picture you don't just see boys names you see the names of girls like Christina and Celina. It reaffirmed all the reasons I wanted to cover sports in the first place. It made me remember growing up in Boston. I was huddled under my blankets after my mother had made me go to bed, and I would listen to the Bruins/Canadiens games on the radio and I couldn't fall asleep until I knew who had won. What happened to hockey in the US since I was a kid? One thing is for sure, just a few hundred miles north of us in Montreal, Quebec, the passion for hockey is as strong as ever and will likely never die. Great column Bubba. Love the photos. i can just picture bubba huddled up under the covers clutching a....sandwich?